Latest post Sun, Mar 17 2019 6:59 AM by TrevorA. 14 replies. I know this might not be a suitable question for an Avid forum, since it might not be an Avid issue, but i am slowly creeping towards insanity on this one. I am looking for all the help i can get. We are doing post on a feature, where the sound guy is recording on an Aaton Cantar, he is delivering Poly files, which is usually fine, I have imported plenty of poly audio files into the Avid without issues. But for some reason the files he has delivered so far imports fine except the track names for track 2-7 are non existing, there are no columns for them, even if a load them into a bin with a bin view with several tracks showing.. I then proceeded to do the usual google'ing, but to no avail, i could tell other people have had the same issue, but i couldn't find a solution to the problem. I thougt for a moment that it might have something to do with Avid only reading the BEXT data in the file. As it is now i am loading the poly files into Wave Agent where the track names show up as they should, i then split the poly file and combine it again, then import it to Avid. And the track names show up fine. I am just left wondering if anyone has had the same problem and found a better solution? The thing is, if you import poly's, the track descriptors are not baked into the independent files. They might be listed in some header for the entire multichannel clip, but that's not useful. And indeed, Avid MC does not support iXML through File->Import (they do over AMA, but that is a dangerous method!). Bummer, and a darn shame that Avid and Aaton never worked this out properly. - import the individual mono's WITHOUT using the "autodetect BWF groups" (or something like that; if you DO use that option, only the metadata for channel 1 is used for the clip). You will now see that the individual tracks all have their own track descriptors, and if you were to export them to ProTools you would find that this metadata is actually baked into the actual Avid mediafile(s). - Import the ALE from the sound dept [or the one you created in Majax], set the Shot Log options to "Maintain Events As Logged". - Select the clips generated by the ALE, choose Clip->Relink. This should now relink these multitrack clips to the individuale monophonic imports. Alright, thanks for the reply! This eases my mind a bit, even though it really is a bummer that they couldn't work it out. I thought for a moment i was missing something really simple, but from what you're saying it seems like it just can't be done the normal, easy way. I'll try your suggestion and see if i can't make work that way. Once again, thanks for the reply! I have the exact same issue (MC 8.4.5 and Cantar X2 & X3). I have 8 tracks BWF to import. With "import", some metadatas are missing. Via "link import", metadatas are present (but it's not a solution in my case > feature film). Is there an other way than relinking with ALE to solve this ? Am I missing something ? We are having a similar problem, too (a month later). Our AAF we sent to Sound allows for 'Expand All Tracks' function in ProTools but there seems to be metadata missing such as the track labels (found under the TRK1 to TRK8 headings in the Avid bin for each poly clip that was imported directly into the Avid). If we discover anything, will let you all know, but hopefully someone has a suggestion that will take some of the pain out of figuring this out. If they were BWF-P, I don't think they make it into the MC's actual media file, only into the master clip. And PT is stone deaf to the metadata from AAF's. Also, I have found some metadata from imports to get baked into OMF media that does not get baked into MXF audio media files -- or at least not seem by PT. Best way to force PT to see metadata is to bring in the original wav's, along with your AAF and MXF media, and have PT treat your Avid tracks as Field Recorder Guide Tracks, then make PT find Field Recorder originals. Seeing as using AMA seems to bring in more audio metadata ... could you somehow AMA link, copy the metadata or make an ALE, etc. Then tranditionally import the audio (therefore preserving the ability to perf slip, etc). And then marry the AMA file`s metadata to the one you imported? Has anyone found a solution to this? Having the same trouble with our sound dept, the usual workaround is using OMF media, but this is a mess on the Avid side and an extra rebatch to omf session isn't much of a choice due to time issues. but haven't got the time (or software) to verify. If I Import a poly BWF file, I get no channel metadata. If I use AMA Link instead, I don't get channel metadata either. According to Marianna, this should work, so I don't know what the problem is... I'm specifically choosing the built-in WaveAIFF plug-in in the Link to Media window. I split the Poly BWF into Mono files, using WaveAgent (which is free and preserves all the original metadata). I AMA Link the Mono files into avid activating the option "Autodetect Broadcast Wave Monophonic Groups". That way, I don't end up with one master clip per channel (just one master clip per take, with all the tracks). And what's best, the master clip displays all the channel metadata entered by the sound recordist properly in the Bin. Finally, I Consolidate the AMA Linked master clips and work with MXF Avid MediaFiles moving forward. I've exported an AAF to ProTools just for testing ("Include Inactive Audio Tracks" option is enabled), and my sound guy has no issues with this workflow. He can actually link my AAF to the original Poly BWF files, switch takes by right-clicking in ProTools, etc. I'm having the same issue working with 6 channel Poly BWF files, generated in a Nagra VI recorder. If i Import them, Avid will only read BEXT metadata (and ignore iXML metadata) - and unfortunately there is not enough room in the BEXT header for all the track names, so no channel metadata comes across. According to Marianna, AMA Link reads both, BEXT and iXML metadata. But if I Link my Poly BWF files using specifically the WaveAiff Plug-In, still no channel names come across. So this is clearly not working: currently there is no way to bring that metadata into Media Composer unless you use an .ALE file (which my sound department can't provide). I split the original Poly BWF using WaveAgent. I AMA Link the resulting Mono BWF enabling "Autodetect Broadcast Wave Monophonic Groups", so I just end up with a single audio master clip per take. At least, using AMA, all the channel names come across when Autodetecting Groups (unfortunately, this doesn't work over Import - you only get the name of the first channel). I Consolidate all the Linked files... and from that point on, I exclusively work with the MXF rewrapped Avid MediaFiles, because I don't like to mix workflows (my rushes are delivered as DNx36 MXF files). 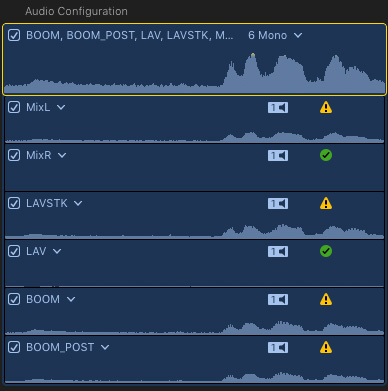 This workflow requires a few extra steps and it's kind of limiting, because Avid knows the audio was ingested over AMA Link (Consolidating won't full the application), which means I cannot adjust Sync by Perforations (1/4 frame). Believe me, I've tried and I get the following message: "This clip was not digitized with audio rate addressing". All the audio channels are properly named. I can disable channels across multiple clips in a batch in the Browser. I can adjust sync at the sample level, and more importantly, at any point in time (even after creating Synchronized or Multicam clips). I can display audio channel names in the magnetic Timeline when I need to. I can Mute or Solo audio channels across my Timeline without paying attention to track numbers. I'm not intending to hijack every thread on this issue, but I've developed a little app to perform a workaround while we wait for Avid to sort this issue out. Prior to ingest, it splits and renames the files to include the track names so we can see them on the timeline. Take a look and let me know any comments, etc. I've developed a little app to perform a workaround while we wait for Avid to sort this issue out.